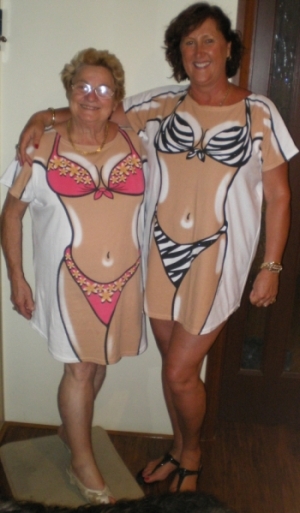 Kerri, from the tennis group, The Hot Pink Ladies, had bought a Zebra Bikini T-Shirt cover-up from Carol's Cover-ups at Cotton Tree Markets and was so impressed with the novelty idea that she bought a further six different cover-ups the next day. 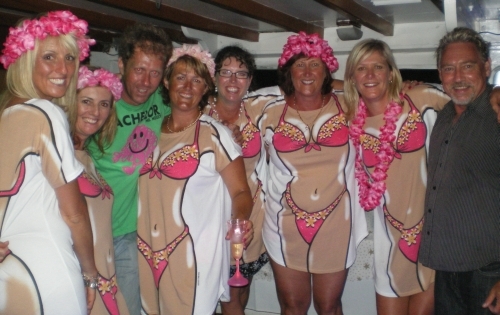 Then, when wanting an outfit for the Hot Pink Ladies, for their Country Week Tennis function in Sydney in January 2009, Kerri had the idea of all the ladies wearing the Pink Frangipani Bikini T-shirt. After donning their outfits for the function, they walked to their venue and heads were constantly turning to watch the ladies walking down the street. They were stopped many times by people wanting to take their photographs. So what would normally be a 5 minute walk took 30 minutes! 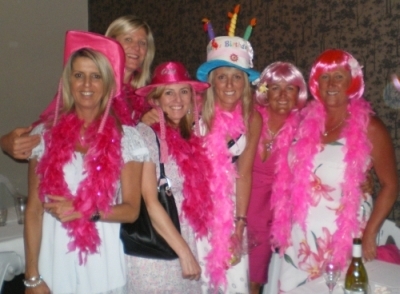 As you can see from all the happy faces in the pictures below, the Hot Pink Ladies had a fun time ! Thanks to Kerri and the Hot Pink Ladies for permission to use their photos. Even a guy wanted to wear a bikini cover-up!